Girolamo Cardano was an Italian doctor, natural philosopher, and mathematician who became a best-selling author in Renaissance Europe. He was also a leading astrologer of his day, whose predictions won him access to some of the most powerful people in sixteenth-century Europe. 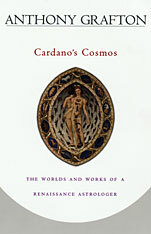 In Cardano’s Cosmos, Anthony Grafton invites readers to follow this astrologer’s extraordinary career and explore the art and discipline of astrology in the hands of a brilliant practitioner. Renaissance astrologers predicted everything from the course of the future of humankind to the risks of a single investment, or even the weather. They analyzed the bodies and characters of countless clients, from rulers to criminals, and enjoyed widespread respect and patronage. This book traces Cardano’s contentious career from his first astrological pamphlet through his rise to high-level consulting and his remarkable autobiographical works. Delving into astrological principles and practices, Grafton shows how Cardano and his contemporaries adapted the ancient art for publication and marketing in a new era of print media and changing science. He maps the context of market and human forces that shaped Cardano’s practices—and the maneuvering that kept him at the top of a world rife with patronage, politics, and vengeful rivals. Cardano’s astrology, argues Grafton, was a profoundly empirical and highly influential art, one that was integral to the attempts of sixteenth-century scholars to understand their universe and themselves.